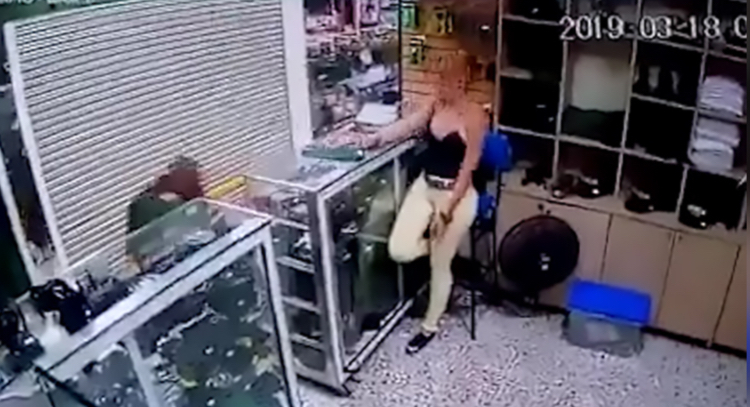 The incident took place in the city of Medellin in the north-western Colombian department of Antioquia when the police captain and head of the Special Security Operation Group, identified as Edilberto Ortiz Correa, went to visit his ex-girlfriend in the shop where she worked. In the shop’s CCTV footage, the uniformed officer is seen talking to a woman behind the counter. The 32-year-old cop then takes out a gun and shoots himself in the head without hesitation. Ortiz Correa falls to the floor and his bloodied head is seen resting against the shop’s shutters. Meanwhile, his ex-girlfriend looks on in shock before taking out her phone. The police captain was rushed to a nearby clinic where he was pronounced dead nine hours later. Metropolitan police spokesman Eliecer Camacho said that the officer’s death was “suicide, apparently over a personal reason”.